The Fat Resistance Diet is the creation of Dr. Leo Galland who is recognized as an expert in the field of nutritional medicine. It is based on the concept that hormones, which include leptin and adiponectin, control the appetite and body fat levels in the body. When the body fat level becomes too high this causes inflammation that subsequently alters the body chemistry and balance of these hormones. Dr. Galland states that it is possible for dieters to achieve their ideal weight by reducing inflammation and restoring the biochemistry which works to reduce cravings, increase metabolism and promote fat burning. In addition this dietary approach has been associated with improvements in cholesterol and blood pressure. There are three stages to the diet. In the initial stages most high carbohydrate foods are avoided such as grains and starchy vegetables. As the dieter progresses through the three stages the amount of carbohydrates is gradually increased. The first stage is concentrated on reducing inflammation and restoring blood glucose balance. This is achieved by an abundance of super foods in the diet and 9-10 serves of fruit and vegetables every day along with a relatively high intake of quality protein. The high nutritional quality of the stage one diet will help to rebalance body chemistry and reduce cravings for carbohydrates. This stage also provides a jumpstart to the fat loss process. The second stage increases the choice of foods so that it is suitable for long-term fat loss. After completing the stage one diet the insulin levels in the body should have decreased which allows for tolerance of more complex carbohydrates in the diet. As such this stage allows for reintroduction of legumes as well as some whole grains such as oatmeal and brown rice. The third stage is the maintenance stage where the variety of foods is increased further to include healthy grain based meals such as carrot raisin muffins, blueberry flax pancakes and pasta. The inflammation reducing foods are still emphasized while the caloric content of the diet is slightly higher to allow for maintenance of weight loss. Foods to be avoided include caffeinated coffee, refined grains, sugar, processed foods and alcohol. The foundation of the diet is an abundant intake of fresh fruit and vegetables as these contain phytonutrients such as carotenoids and flavonoids that have an anti-inflammatory effect. Foods high in carotenoids include carrots, broccoli, spinach, tomatoes, pumpkin and papaya. Foods high in flavonoids include blueberries, cherries, pomegranate, citrus fruit, dark grapes, green tea, onions and dark chocolate. Fresh herbs and spices are also regarded to supply the body with important nutritional factors that reduce inflammation as well as improving the taste of foods without adding calories. The diet also emphasizes increasing the intake of foods that are high in good fats such as the omega 3 fatty acids found in fish, walnuts, flaxseed and green leafy vegetables. These fats play an important role in reducing inflammation as well as improving general health. Low glycemic carbohydrates are highlighted. In the later stages of the diet when carbohydrates are gradually reintroduced they are selected from sources such as legumes and whole grains. The diet plans are designed to allow for a weight loss of two pounds per week. Separate plans are provided for each stage of the diet. Look for other meal ideas here. 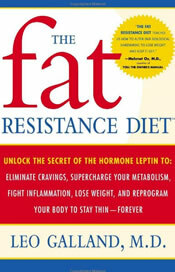 The Fat Resistance Diet retails for $12.95. Very nutritionally dense with a high intake of fruit and vegetables. The high fiber, protein and good fats in the diet will work to reduce appetite fairly quickly for most dieters. Provides detailed meal plans and recipes for each of the three stages of the diet. Reduces risk of many chronic diseases such as diabetes, heart disease and cancer. May require an increased amount of time for food preparation. Some dieters may experience discomfort as they withdraw from caffeine and sugar. This is a very high nutrient diet that will no doubt improve many aspects of the dieter’s health both in the short term as well as preventing many chronic diseases that are associated with aging while allowing for weight loss that can be maintained as part of a healthy lifestyle. Lihn, A. S., Pedersen, S. B., & Richelsen, B. (2005). Adiponectin: action, regulation and association to insulin sensitivity. Obesity reviews, 6(1), 13-21. I bought the book and really like everything I’ve read and heard but I’m a vegetarian and would like to know if there’s a substitute for meals that include meats. If I substitute my own source of protein will it alter the benefits and my weight loss on this diet? On November 24, 2009 you had a recipe, “Oven-Roasted Fall Fruit and Vegetables” (Brussels Sprouts, apple, onion) which was delightful. I have misplaced the second page of this recipe and would very much appreciate it if you could forward it to me at DDubbleD@cox.net. Incidentally, since getting my new computer, I have not had any e-mail from The Fat Resistance Diet and would love to be reinstated. Doris, This isn’t the FFR diet, but only a review sorry. Awesome! It’s a good diet.